Wendy L. Powers was born in Laconia, New Hampshire, and moved to Manchester, New Hampshire after graduating from Winnisquam Regional High School to attend Hesser College. Wendy graduated with an Associates Degree in Legal Secretarial Science. 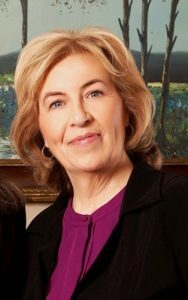 Wendy began her legal career with Attorney Joseph M. Wisniewski, Jr. and went on to work with Attorney W. Jean Laflamme at Laflamme, Champagne & Moquin, PA; Attorney Wilbur A. Glahn, III, at the McLane Law Firm; and spent 25 years with Devine & Nyquist, PA.
Wendy began working in the practice of Family Law at Shaheen and Gordon, PA, with Attorney Andrea Q. Labonte. She has found her passion in this field of law where she can help people in difficult situations. She currently resides in Hooksett, New Hampshire with her partner of almost 40 years, Ralph Carignan. She values the time she spends with her family which includes her son, step daughters, 15 grandchildren, and great grandson. When not at work, she enjoys camping, traveling, and spending time in the Lakes Region and mountains of New Hampshire.